What is the Surname Browse? How do I search the Surname Browse? What information will I see on the results page? How do I see what records are available for my ancestor's surname? Why do I sometimes get zero hits when I click the surname in which I am interested? Why do I get a login/registration page when I try to view a record? What are the advantages of using the Surname Browse? How do I navigate many pages forward or back in the Surname Browse Index? Why do some surnames look as if they are misspelled or corrupted in some other way? Can I find names that are spelled with foreign characters? The Surname Browse is an index to the millions of unique surnames contained in our Ancestry Archive database. It allows you to view an alphabetical list of all the surnames in the Archive. You begin your search by entering just a few characters of a surname. 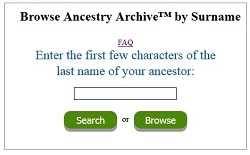 For example, if your ancestor's surname was Hayes, you might begin your search with "Hay." That would take you to a list of all surnames that begin with those letters. The Surname Browse search was created to help our patrons determine if a particular surname exists in the Archive and how that surname might be spelled. When you search in the Ancestry Archive using the main search screen, it will only return results that match the surname you have entered exactly. However, your ancestor may be listed under an alternate spelling of their surname or their surname might have included a foreign character. So, you could be missing out on valid results. 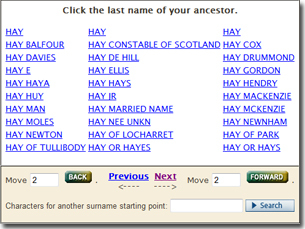 To return to our example, your Hayes ancestor could very well have been listed as Hay or Hays. Emphasis on spelling a person's name in a specific way is a fairly modern concept. Your ancestor's last name may have been spelled in different ways on various records throughout his or her life. For this reason, it is always a good idea to search for different spelling variations. For more information on surnames, check out this article, What's in a name? Part 2: Your Surname. Another instance in which the Surname Browse can be useful is when an ancestor's surname consists of more than one name, such as in the case of Spanish names. In order to search the Ancestry Archive for that individual, you would need to know how both names have been listed. Searching the Surname Browse allows you to more easily locate those multiple name entries. Select the Search menu from the top of the screen. Click on the Specialized Searches link. Click the Surname Browse link. You should now be on the Surname Browse page. 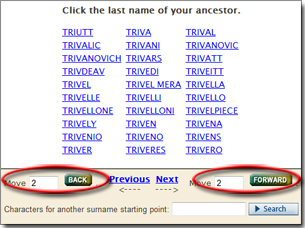 Enter the first few characters of your ancestor's last name in the search field. That should take you to a results page, where you will see an alphabetical list of surnames beginning with the characters you entered into the search. You can use the options on the page to scroll through the list. If you click on a surname, you will be taken to a simple search screen. From there, you can enter an event year and complete a search for the surname in our Ancestry Archive database. The first thing you will see on your results screen is a list of your actual results. This will be an alphabetical list of surnames from the Ancestry Archive that begin with the characters you entered into the search. Up to thirty names will be listed on each page. If you click on a surname, you will be taken to a simple search screen. From there, you can enter an event year and complete a search for the surname in our Ancestry Archive database. Next you will see some options that allow you to scroll through your results. In the center of that line you will find the Previous and Next links. These allow you to go back or forward through the list of surnames one page at a time. There are also options to move back or forward through the list more than one page at time. By default, these options are set to 2 pages. You can change that by deleting the 2 and entering another number in that field. Then click either the BACK or FORWARD button to move that many pages back or forward in the list. The final feature on the results screen is a search box that allows you to start a new Surname Browse search. Just enter the first few characters of the surname and click the SEARCH button. When you are viewing your Surname Browse results, you will note that each surname is a link. If you would like to see what records are available in the Ancestry Archive for a particular surname, click on that surname. This will take you to a simple search screen. The surname will already be entered into the search form. You can also add a first name, if you would like. However, the first name field is optional. Then select an event type (Born, Died, or Married), enter a year, and select a year range (0, 2, 5, 10, or 20). The event year field is a required field. Click the Search button to complete your search. You will then be taken to an Ancestry Archive results screen, where you can see what records are available for that surname. If you have any questions about the simple search form, see How can I do a simple search in the Ancestry Archive?. If you have clicked on a surname from your results list, completed the simple search, and received no results in the Ancestry Archive, there are a couple of things that might have happened. The most likely reason you got zero results is that there are no records for the surname that match the other information you entered into the search form. If you included a given name in your search, we may just not have any records listed under that exact name. Keep in mind that your ancestor's first name may have been spelled in different ways throughout his life, just like his surname. You may want to try another search without the first name. That will allow you to scroll through the results and see if there are any records listed under an alternate spelling or nickname. It may also be that there are just no records for the particular event type you selected. For example, we may have a record of your ancestor's marriage or death, but not her birth. Try your search again with a different event type selected. Finally, consider widening your event year range. Even if you know the exact year the event took place, we suggest that you begin with a year range of at least 5 years so that you will be sure to see as many relevant results as possible. It may be that we have a record which differs slightly on the year that the event took place, but which still has valuable information on your ancestor. Another likely reason would be that the surname you have found has been changed in the database and the Surname Browse Index has not been updated to reflect the change. If you are taken to a login screen when you attempt to view a record from your results list, it means that you do not have access to the database in which that record is contained. We do have some records that are available for free, such as the Social Security Death index, but most of our records are contained in our subscription database. You can view the full record by making a payment or submitting your family tree. If you already have an active subscription with us, just login to your account to access your results. The Surname Browse has great advantages for those who are not sure how a surname is spelled, especially if there might be a foreign character in the name. It lets you to scroll through an alphabetical list of all the surnames contained in our Ancestry Archive database, allowing you to see exactly how a particular surname is spelled in our records. The Surname Browse is also useful when searching for an individual whose surname consisted of more than one name, such as in the case of Spanish names. It can be difficult to locate records for that individual because the Ancestry Archive search is looking for the exact spelling of the surname. Therefore, if you do not know the order in which the surnames are listed, or perhaps know only one of the surnames, you might not be able to find the record through the regular search. Using the Surname Browse, you can see exactly how the surname is listed in the Archive. Because the Surname Browse allows you to view an alphabetical list of all the millions of surnames contained in the Ancestry Archive, you may find it tedious to scroll through the list one page at a time. If you would like to jump ahead or behind several pages at once, you can do so using the BACK and FORWARD options found on the results page. By default, these options are set to 2 pages. You can change that by deleting the 2 and entering another number in that field. Then click either the BACK or FORWARD button to move that many pages back or forward in the list. The surnames appear in the Surname Browse list exactly as they are spelled in the records contained in the Ancestry Archive. If the surname is misspelled or otherwise corrupted, that is how it was submitted to us. For example, a database owner will occasionally enter the Jr and the Sr in the Surname field along with the surname. Also, they may have accidentally entered the middle initial in the surname field. This then becomes the way in which the surname is listed in the index. Keep in mind that emphasis on spelling a person's name in a specific way is a fairly modern concept. Your ancestor's last name may have been spelled in different ways on various records throughout his or her life. One of the advantages of using the Surname Browse is that it allows you to see possible spelling variations. For more information on surnames, check out this article, What's in a name? Part 2: Your Surname. Yes, names with foreign characters are listed in the Surname Browse index and this is an excellent way to view them.